Vape Mod RBA RDA Vaporizes E-Liquid E-Juice. Up-Close Cotton and Coil Wire. Vape Mod RBA RDA Vaporizes E-Liquid E-Juice. Up-Close Cotton and Coil Wire With Hand. Dripping e-liquid on the coils of an e-cigarette. Macro shot. Showing burn of e juice or e liquid in the coil, wire and cotton inside the atomizer of electronic cigarette for vaping. Showing burn of e juice or e liquid in the coil, wire and cotton inside the atomizer of electronic cigarette for vaping. Macro shot. Dripping e juice or e liquid from dropper into coil, wire and cotton inside the atomizer of electronic cigarette for vaping. Macro shot. Cropped view of man filling electronic cigarette with e-liquid isolated on black. 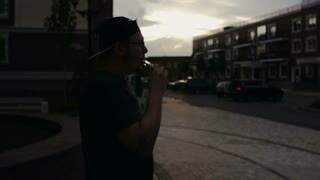 Young Man Smoke E-Cigarette At Sunset. Vape. Slow-Mo. Young Man Sitting On Street And Smoke E-Cigarette At Sunset. Vape. Slow-Mo. Young Man Stands On Street And Smoke E-Cigarette At Sunset. Vape. Slow-Mo.